Evan McGuire (Clonmel Celtic) rounds the St. Michael's keeper to score his side's goal in Saturday night's Tipp Cup semi-final played at the By-Pass in Clonmel. 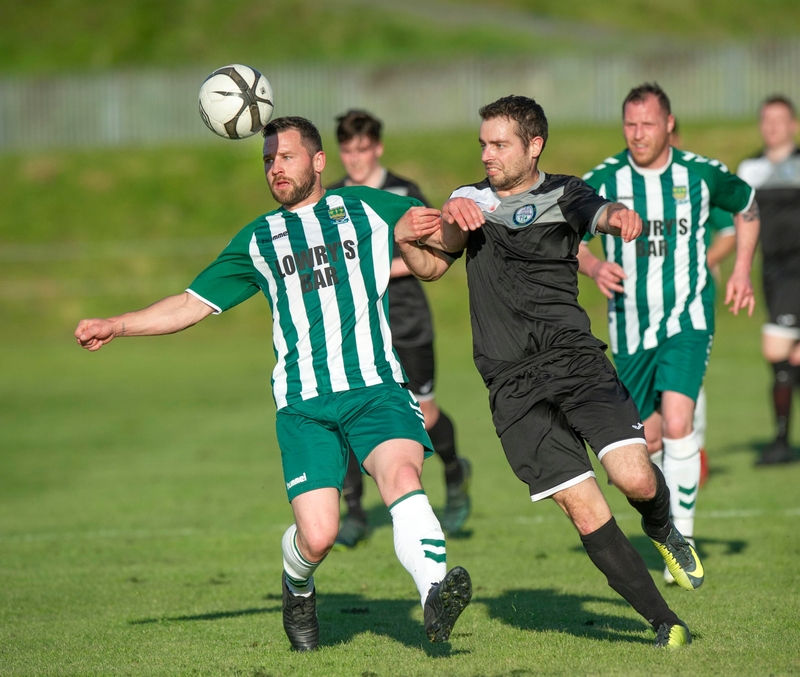 Clonmel Celtic’s season ended in disappointment on Saturday night failing to reach the Tipperary Cup final after a 4-1 home defeat to a rampant St Michael’s, who are now odds on to complete another domestic double. The home side started well in the glorious sunshine with Adrian Walsh needing to get down smartly saving Cian O’Sullivan's effort after he was set up by a clever Kevin Waters cross. Evan McGuire then flashed a shot wide as Celtic continued to probe in the early stages. Despite their bright start however, the visitors took the lead on ten minutes when a swift move carved Celtic open too easily and Ollie O’Driscoll slotted home. After the goal the visitors got on top and were two up eight minutes later when Paul Breen was free at the far post to score from a corner. The hosts continued to make chances and came close to halving the deficit minutes later but Cian O’Sullivan couldn’t keep his header down from an Evan McGuire cross. Saints then broke swiftly just before the hour mark and put the game beyond Celtic when David Slattery fired home to make it 3-0. Mindful of having gone down to a heavy home defeat to St Michael’s earlier in the season things looked ominous for Celtic and more so when they were reduced to ten men just before the break. Three down, a man down and with little game time in recent weeks things looked bleak for Celtic when they kicked off the second half. In fairness to the home side they can be well satisfied with a great effort and fighting performance in that second period. Despite having a man less they had more possession and played most of the game in the oppositions half. After a good move involving a smart pass from Cian O’Sullivan, a Niall Prendergast effort smashed against the bar. They kept pressing and on 61 minutes they got one back when Evan McGuire got on the end on a long pass to beat Walsh to the ball and roll the ball into an empty net. Within two minutes Celtic were almost in again when Peter O’Dowd flashed an effort just past the post. Despite a brave effort Celtic couldn’t get a second that could have set up an interesting finish. 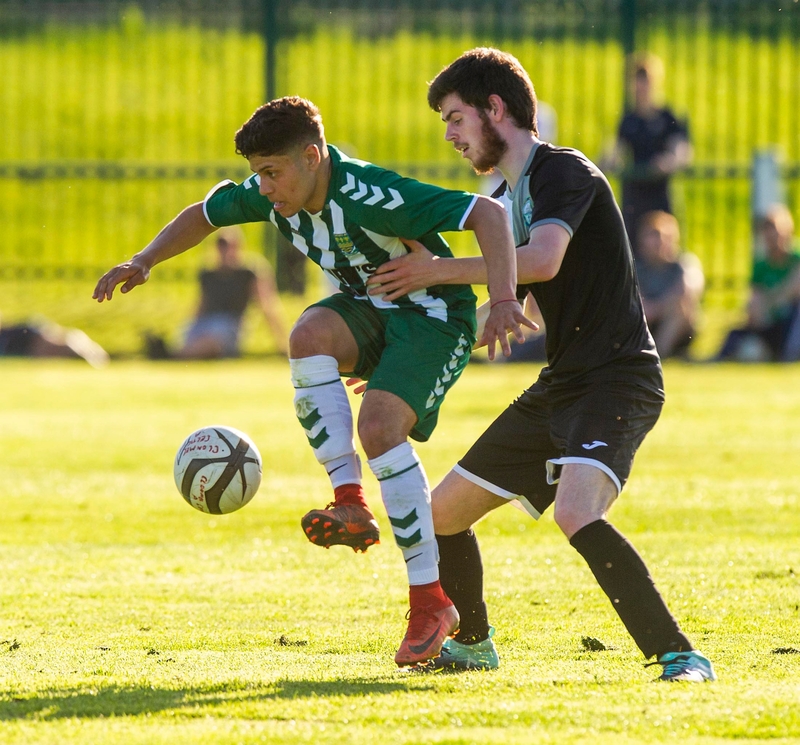 If anyone deserved the fifth goal of this tie it was Celtic with a courageous second half effort but it was not to be as Ollie O’Driscoll netted with the final action of the game to see St Michaels reach the final on a 4-1 scoreline. Sean O'Hara (Clonmel Celtic) powers above David Salttery (St. Michael's) to win this header in Saturday evening's Tipp Cup semi-final at the By-Pass in Clonmel. This had all the feeling of what could have been an epic Tipperary Cup semi-final but in the end it petered out into an easy win for Town to set up what will hopefully be another classic game between themselves and double chasing St. Michael. The early part of the game was close enough with both sides sussing out the other. Town were showing a little rustiness from lack of game time over the past few weeks and missed a couple of scoreable chances before they finally did breach the home defence ten minutes before the break. A long throw into the box evaded the home defence and Keith Cashman pounced to fire to the net from close range. Five minutes later the visitors made it 2-0 when Cashman turned provider this time to set up Dylan Guiry for a goal and this was how the game went to the break. Old Bridge had an excellent chance to get back into the tie in a first minute of the second period when they were awarded a penalty, but they were unable to convert. A minute later they spurned another chance when the Town keeper denied Chris O’Gorman with an excellent save. The hosts were soon made to pay for not making hay. Town settled and Craig Guiry followed his brother onto the scoresheet with a cracking effort in the 55th minute. The visitors took complete control of the game after this and looked like scoring every time they attacked a Bridge defence that looked completely void of confidence. 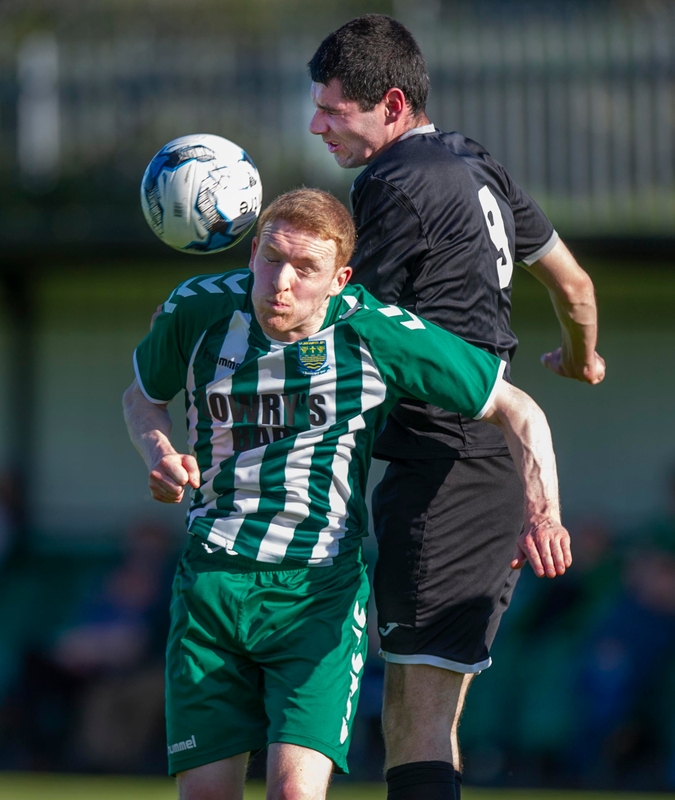 A brace of goals in the 64th and 73rd minutes by Conor O’Sullivan further deflated the Green Lane faithful and two more inside the final 15 minutes by Tony Scully and Keith Cashman put the Town fans into seventh heaven and sent them on the way to the Cup final. Rodrigo Goncalves (St. Michael's) under pressure from John O'Connor (Clonmel Celtic) brings the ball under control during the Tipperary Cup semi-final played at the Clonmel By-Pass on Saturday evening last.